Coffee is not an obvious beverage. It doesn’t help you recognize its goodness. You literally have to pummel and crush it into tiny particles to discover its potential. Pretty dramatic, huh? 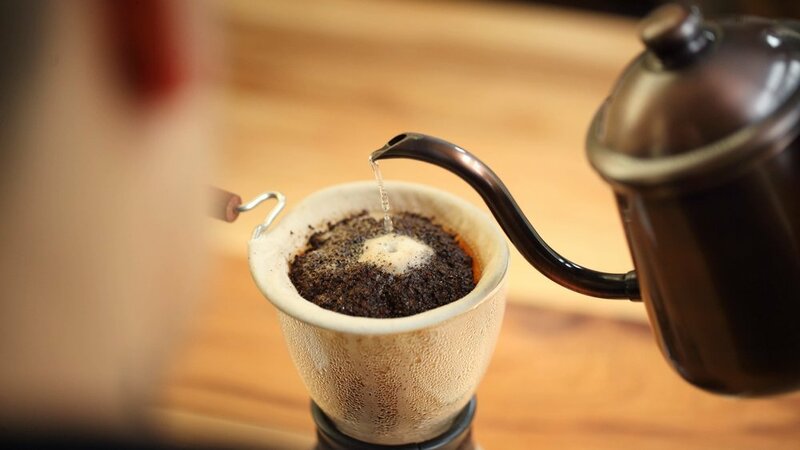 We call this process grinding—and it’s basically impossible to enjoy coffee without it. I spoke a bit about how to work with grinding in a previous post about bitterness, but now I want to address the overall grinding process. Grinding breaks whole coffee beans into small particles to give the water access to the good stuff in the beans, which ultimately gives us access to the good stuff in the cup. Pretty simple, right? Not really. There are two aspects of grinding that are crucial to making delicious coffee and that can be tricky to get right: Grind quality and freshness. Grind quality is defined by how consistent a grinder can make those little particles. A blade-style grinder does a very poor job at this, creating some really large pieces and some really small pieces. This can lead to both bitter and sour flavors coming out of a coffee at the same time. Burr-style grinders are your best opportunity to get the most out of a coffee, because they create similar-sized particles. (I am a big fan of the Baratza Virtuoso). Not all burr grinders are created equal, though, and small home grinders can’t compete with large, industrial grinders. To make things even trickier, how you grind your coffee is entirely dependent on what kind of coffee it is and how you are planning to brew it. Every morning, in our cafes, our baristas “dial in” the coffee, meaning that they adjust the grind to get it exactly right for that particular coffee in that particular moment. This changes on a daily basis—there is no master key. At best, this is a coffee lover’s opportunity to tinker and explore. At worst, this is a science experiment before the break of dawn, before you've had your coffee. Freshness is a pretty simple matter. Once the coffee has been roasted to that quintessential chestnut brown, a clock starts ticking. That’s the freshness clock. When it runs out, so does your opportunity for the maximum joy that can be received from a cup of coffee. Even more troublesome is what happens when the coffee has been ground—that clock starts ticking at hyperspeed. You know that amazing fresh-ground coffee smell? You know how when you smell it you can almost see it emanating out of the cup because the aroma is so enticing and alive? That’s your coffee’s flavor dissipating into the atmosphere. This happens at such a rapid clip that the coffee will have lost a significant amount of oomph minutes after exposure to air. Having a grinder at home helps you keep the magic alive because it enables you to grind the coffee right before brewing, getting the most freshness and flavor possible out of every cup. This last point has been a sort of hospitality bulwark for us. It relates to one of the more contentious stands we have ever made in our cafes, which is that we refuse to grind your coffee, even though we sell whole beans. We just can’t be party to offering you what we know would quickly become a stale bag of coffee. It seems stubborn, and we’re sorry. But we don't want to let you down after you have just paid us good money and invested your high hopes in getting something worthwhile and delicious. As luck would have it, this dramatic conundrum has been addressed by science. Over the last few years our VP of Technology Neil Day has been hard at work trying to resolve this problem of coffee grinding and freshness, ultimately coming up with Blue Bottle Perfectly Ground. This is as about as close as science comes to imitating magic. Neil managed to create a process in which we get to use our super-fancy industrial grinders (we like this one) in a specially designed environment that stops time as the coffee is ground. Not only that, but the coffee is ground at just the right setting and at just the right amount down to the gram. You can read more about it here and here. So, if you are not interested in buying a grinder, fiddling around with adjusting a grinder to get to the right setting, or using a scale to weigh out the right amount of coffee (or maybe this just sounds like too much to think about at 6 am), Blue Bottle Perfectly Ground is your huckleberry. All that said, grinding is not just an important step, but an essential one in brewing. Doing it right and doing it fresh (or having Perfectly Ground take care of it for you) is non-negotiable if you are looking for that transcendent cup.